US sprinter Manteo Mitchell revealed he broke his leg half way round the track but still managed to finish the men’s 4×400 meter Olympic relay final. Manteo Mitchell, a 25-year-old 200 and 400 meter runner, ran the first leg of America’s heat on a blazing hot day inside London’s Olympic stadium and although he finished with a limp there was no obvious sign of the pain he was feeling. “I got out pretty slow, but I picked it up and when I got to the 100-metre mark it felt weird. As soon as I took the first step past the 200-meter mark, I felt it break. I heard it. “I even put out a little war cry, but the crowd was so loud you couldn’t hear it,” Manteo Mitchell said. “I knew if I finished strong we could still get it (the baton) around. I saw Josh Mance motioning me in for me to hand it off to him, which lifted me. 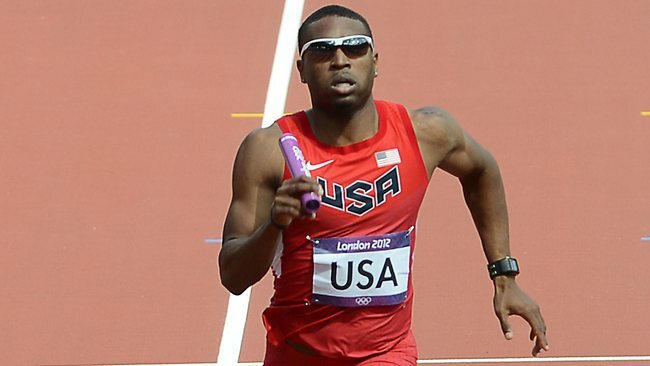 Manteo Mitchell’s decision to go through the pain barrier allowed his U.S. team mates to sprint to a joint finish with the Bahamas in identical times of 2 minutes 58.87 seconds, the fastest ever run in the first round of the relay at the Olympic Games. Manteo Mitchell, who ran his leg in 46.1 seconds, said that he had slipped on a stairway this week in the Olympic village but had completed workouts since, including a warm-up for Thursday’s race. After the race an x-ray revealed he had broken his left fibula bone. The U.S. team was already without 2008 Olympic 400m champion LaShawn Merritt, whose title defense lasted only moments last Saturday when he pulled up with hamstring problems. The U.S., one of the favorites for gold, will name their final line-up on Friday.